Burning tiki torches line the first few metres of the course, while Rastafarian drummers beat out the signature soundtrack. 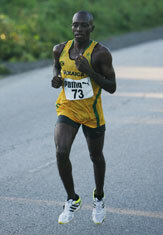 In the early stages, run under the dark sky with the moon still high, Kimoy Cambell pulls away from the pack to repeat his 10km win of 2008, with a time of 30:25. As the sun rises, so do the residents of Long Bay. Children run alongside shouting encouragement, high-fiving and bumping fists with the runners. Runners pass through small, sleepy towns with names like Bloody Bay, Crocodile Rock, and Orange Bay. Supporters gather on the sides of the roads, cheering on the runners, some spraying water from hoses to offer temporary relief from the heat. Over 300 people volunteer to ensure the marathon runs smoothly. Passing the half marathon turnaround, the marathoners continue past Samuels Bay, towards the 26km turnaround point at Green Island. South African runner Gregory Macket takes the run in his stride. This is Macket's first time in Jamaica, and after participating in many marathons, including the Comrades, he is not nervous, "It's just running", he exclaims the night before the race. With his easy smile and relaxed demeanour, he is the perfect fit for a Caribbean island. It is not surprising then, when Macket explains that his grandfather was born in Jamaica, and he is hoping to reconnect with many relatives. Luke Kibet hobbled away from the finish grateful to have broken the course record rather than break his tendon, an injury to which had been troubling him since well before the race. The former world champion's winning time looks a lot more impressive in Singapore's 31°C heat and oppressive 77% humidity than it would almost anywhere else. 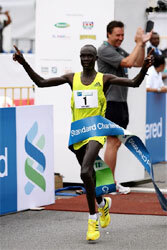 He was pushed all the way by Johnstone Chepkwony and won in a sprint. Last year, he had beaten him, in 2:13, by over two minutes. A dozen or more men were a minute up on record pace after 10km. Vincent Krop, more a half-marathoner, was the agreed pacemaker but went on to finish third. Kibet, favouring his left achilles' tendon, had kept to the back of the pack, while Krop, Leonard Mucheru, and Chepkwony had forced the pace. Mucheru was first to drop, at 36km, followed by Krop, just before 40km. Kibet then tested Chepkwony with a surge, to which the 25 year old responded. But when they entered the finishing straight Kibet eased away to victory. Chepkwony and Krop were also under the previous record. "Two-eleven here is like 2:06, 2:07 in a cooler place" said Chepkwony. Lyubov Morgunova, 38, and a veteran of more than 40 marathons, had taken up the running after a slowish first 10km, and her pace eventually dropped all but Magdaline Chemjor of Kenya. Then Chemjor fell back, fading to seventh. The last 10km looked like a formality for Morgunova until Albina Mayorova-Ivanova caught her at 35km. From 10th at halfway, in 1:17:28, over a half minute behind the leaders, she ran a faster second half of 1:15:21, to win easily in a time second only to Salina Kosgei's 2:31:55 course record in 2006. As Morgunova hung in to finish second Mary Akor Beasley of the USA came through to take a surprise third although she collapsed over the finish line, and had to be stretchered off to recover. With a moonlit sky in the wee hours of the morning, a group of truly dedicated long distance runners took to the roads in historic Frederiksted. To run the half or the full was a new decision, as the half was offered for the first time. Billy Bohlke opted to defend his title. He eased through more than three quarters of the race uncontested mostly at sub 6 minutes per mile, until he hit the wall at 17 miles, but hung on to run under three hours. 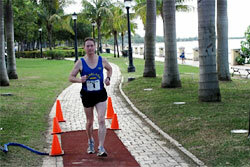 Leading a strong group of aged 50+ men two-time Olympic Marathon runner Calvin Dallas finished second. Heidi Snow enjoyed her first marathon victory as she worked her way through the two groups of runners racing on the same course to finish first among the women. In the half marathon, Juan Robles a CARIFTA medalist and now a student athlete at Turabo University in Puerto Rico led all the way in his longest distance race to date. Ruth Ann-David, V.I. National Marathon Champion, won the women's race and was second overall. Defending champion Tsegaye Kebede won in a record time and a personal best by two seconds writes Ken Nakamura. Kebede became the first runner to defend the title in Fukuoka since Gezehagne Abera in 2001/2. Frank Shorter, 1972 Olympic Champion Frank Shorter won four Fukuoka Marathon tiles from 1971/5, while Toshihiko Seko won three in a row from 1978/80 and again in 1983. "I was convinced of my win after 30km and I knew I had a chance for a personal best when I passed 40km 44 seconds faster than I did last year." Kebede won by 2:34, slightly less than last year. Averaging his top 5 times makes him the fourth fastest marathon runner ever. His personal best is ninth fastest on the list. Behind him, two Ethiopians improved their personal best by huge margins. Tekeste Kebede by two minutes and Dereje Tesfaye, Tsegaye Kebede's training partner, by over three minutes. In between the two Ethiopians, Dmytro Baranovsky recorded his first sub-2:10 marathon since 2006, and the second fastest time of his career. Tomoyuki Sato, coached by Takeshi Soh, was about the only Japanese hope, but had a dismal day as his form completely folded in the later stages of the race. His pacemaker Yu Mitsuya, who did a fine job, is one of the best distance runners in Japan and plans his marathon debut in next February's Beppu-Oita marathon. Passing the half marathon in 1:03:05, the leaders were right on course record pace. Eight runners in the lead pack were still together at 25km. From there Tsegaye Kebede started to run slightly ahead of Samson Ramadhani, the only pace maker left in the race. He led three other runners (Dereje Tsefaye, Evans Cheruiyot and Tekeste Kebede) at 30km (1:29:47). Tsegaye's training partner Dereje Tesfaye was the only runner able to stay with him after 32km, and even he lost contact by 33km. At 38.6km Tekeste Kebede caught and eventually eased past Dereje Tesfaye. Organized by the Macau Sports Development Board and the Macau Athletic Association, the race attracted over 3700 local and international runners to the start from the Macau Stadium at 06.00. Mykhaylo Iveruk from Ukraine, runner-up in 2008, went one better this time, winning US $15000 in prize money. Roman Gebre Gessese from Ethiopia was crowned champion in the female category with the same prize money. More than 30,000 took to the streets in the seventh edition of the Lebanese capital's festival of endurance, including 5km and 10km competitions writes Andy Edwards. Mohamed Temam emerged victorious by over two minutes. This was Temam's third marathon at the tender age of 20 — all three this year. Beginning at 07.00 with overcast skies and the temperature gauge showing 13 degrees Centigrade, these were made to measure conditions for marathoners on a largely flat course. The former world record holder in the marathon, Paul Tergat of Kenya, watched from the VIP stand as 550 competitors set off along Jamal Abdel Naser street. Temam played a waiting game, allowing a quartet to go clear with barely five minutes on the clock. 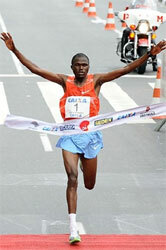 Three Kenyans, Eston Ngira, Stephen Maina and Stanley Mayo took out the pace with Abraham Yilma slotting in behind them. This group of four led through 10km in 32:45 and 20k in 1:04:52. Temam had joined them shortly after 20km, looking comfortable. With 33km covered he made his decisive move, and went through 35km alone in 1:53:50, 50m clear of his compatriot Yilma, and on course for a personal best. Behind him Yilma, second and third in successive years from 2006, is building a solid set of Beirut performances. Mihret Tadesse completed the Ethiopian double as she made it two wins out of two in her marathon career. She improved her best by 31 seconds from her winning debut in Barcelona last year. In the city best known for high-rollers, late nights and adult attractions many are surprised to learn that Las Vegas has hosted a marathon, continuously, since 1967; the seventeenth longest string anywhere. This year's edition was the most spectacular ever. 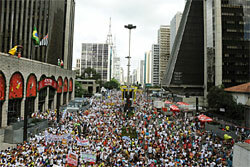 A capacity 27,600 runners started. For the first time in Las Vegas marathon history, the entire Strip was closed in both directions for the runners. The elite women set off 19 minutes ahead of the elite men in a 'Battle of the Sexes' competition for a $10,000 first prize bonus. Caroline Rotich of Kenya emerged victorious by dramatically making up a 23 second gap over the final 3km to catch long-time race leader Alevtina Ivanova of Russia with 800m to go. The win caps a banner year for Rotich, who so far in 2009 has run personal bests at 10km, 10 miles, and the half-marathon. Christopher Toroitich won the men's race. Ethiopians took both Half Marathon races, with Bekana Daba winning the men's race by over a minute, and Werknesh Kidane, an eight-time medalist at the World Cross Country Championships, won the women’s half-marathon. For the first time the entire half marathon was conducted on the Las Vegas Strip, adding to the excitement for the 20,000 plus competitors. The marathon shared the first 16km on the Strip, then had a natural turnaround at 32km. The final 10km was downhill, allowing the marathoners to attack what is usually the most difficult stretch in any marathon. Runners from all 50 states and 39 countries participated in the event which was highlighted by live bands at every mile of the course. The next Rock 'n' Roll Las Vegas Marathon and Half Marathon is set for 5 December 2010 and is expected to top 30,000 runners. 12500 runners entered the 11th edition, a new participation record. Among these were seven Africans — four men and three women — against whom the Brazilians pitted themselves. The African runners had all competed successfully elsewhere in Brazil, and they continued their efforts by filling the top two places in the men's race and the top three places in the women's. Local runner and three-time winner Franck Caldeira put up the best challenge, finishing just one second behind second-placed Martin Sulle and 12 seconds behind the winner Nicholas Koech. Richard Donovan was first of the hardy few to tackle the 100km, over four 25km laps. Conditions underfoot were brutal as snowfall made it feel like running through sand, combined with -14°C temperatures and climbing for a total of 26 miles of the course. The main marathon began in much better conditions with a temperature of only -8°C and little or no wind. The first 25km was run over the churned lap from the 100km, but there were much more favourable underfoot conditions for the final 17km. 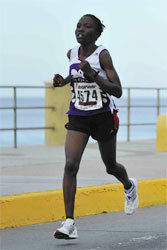 James Kwambai and Pasalia Kipkoech headed the record 21,000 field in the 85th edition writes Eduardo Biscayart. After pacing by Tanzania's Martin Sulle up to 6km Kwambai took the lead at 9km and was never challenged, except by the 32°C temperature. 25-year-old Elias Kemboi, who won the São Paulo Marathon and the Rio de Janeiro Half Marathon, finished second, ahead of three-time São Silvestre winner Robert Cheruiyot. Pasalia Kipkoech might be just 1.42m tall, and tip the scales at 37kg, but she dominated the women's race. After a conservative start, Brazilian Marily dos Santos picked up the pace through downtown São Paulo. 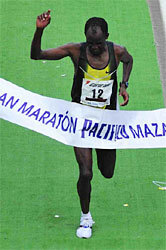 After the "Avenida Pacaembu", Kipkoech had only Ethiopian Zeyneba Hasso for company. She too was soon dropped and Kipkoech won with a comfortable margin of 29 seconds over two-time winner Olivera Jevtic. 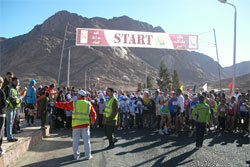 240 participants from 14 countries ran in one or other of the 4 events (5km and 10km races were also offered) that took place on New Year's Eve within the shadow of Mt Sinai ("Moses Mountain") and a short distance from the St Catherine Monastery.